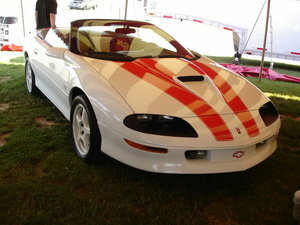 Check out this beautiful 1997 Chevrolet Camaro SS 30th Anniversary SLP Ram Air Edition! This is a rare car being only 1 of 389 SLP Ram Air Editions Built. There are only 15,750 miles on this Camaro since new. It comes fully documented including the original build sheet and dealer window sticker. The previous owner bought this beauty right here in the Great Lake State of Michigan. Only 4 Ram Air cars were registered in Michigan. Don\'t forget this also happens to be a 30th anniversary edition. Out of the 389 SLP Ram Air Cars, this is #0318. Under the hood sits its original Chevrolet 350ci / 5.7L LT1 V8 engine connected to its 700R4 Automatic Transmission and torsen torque sensing Limited Slip Differential. Part of the SLP Ram Air edition includes the lightweight composite hood with functional cold air induction. Level 11 Bilstein sport suspension package helps you around the corners. This is one special Camaro that has already become a collector piece. Add it to your collection today!